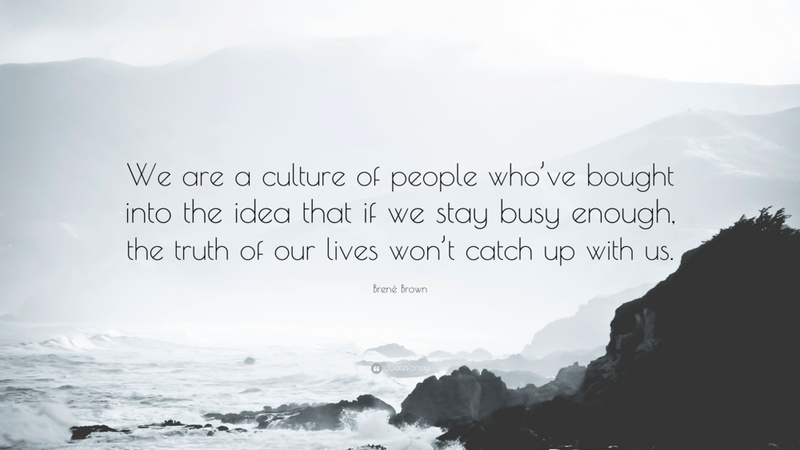 It can be difficult to make the change from being busy to being intentional. Being busy can be a way to ignore those things we dislike about our circumstances or things within us. The problem with being busy for the sake of being busy is that it robs us of living fulfilled lives. It can hide that which we need to confront (deep-rooted fear, anxiety about the future, etc.) or that which we could be enjoying (family, friends, small victories, etc.). Instead of being in control, we are being controlled. Living intentionally produces joys, greater efficiency, healthier relationships, and a healthier mental state. The shift towards living an intentional life begins with getting in-tune with what’s important, increasing your awareness of how your time is spent, and finding the time to invest in you so that you have the fuel to keep going. Prioritize - Identify what’s most important to you and evaluate how much time and effort are going towards those things or those relationships. Time Map - Do you know how you spend your time? Create a schedule to see where your time is going. Invest in you- When we get busy, we forget to invest in ourselves. Start with an achievable goal and schedule in two 30-minute "self-care dates" in your week. Take the time to read a book, watch a TED talk, eat lunch with a friend, go for a walk, etc. Are you sure? Somebody must have made a mistake! How can that be? I just talked with him/her yesterday! Maybe there's been a mix-up in the medical charts. Hospitals can make a mistake!Right? No! No!! No!!! No!!!! NO!!!!! With every fiber of our being we fight a reality that we can't wrap our minds around. How can someone be present one moment and gone the next? We are like the two tantrumyear old who has been told NO. The angry child throws a temper tantrum with their whole body because they arerejecting a reality that they cannot and will not tolerate. When the news of our loved one is delivered we fight totally a reality that we will not tolerate or cannot be able to accept at that moment...mentally, physically, emotionally, mentally, socially or spiritually. How can it be? It was never meant to be this way!IT ALL SEEMS SO UNFAIR! That's where the true struggle in grief comes from. We are forced to accept what to us is the unacceptable. Healing comes when we not only accept the facts of the death in our minds but the emotional impact onour hearts. With the support and understanding of compassionate and listening people in our lives, we mourners can start to do that. Remember that grief is a process that takes time. It is not an event. But most important to remember is that grief should never be done alone and in silence. Reaching out for help and support in the grief journey is the first step toward healing and hope. Parents and caregivers who recognize that behavior has a purpose and is typically influenced by other factors can help children construct the essential skills to communicate more effectively. When the going gets tough try these out! 1. Boost Good Behavior - Praise your child for correct behavior. “Catch” them doing the right things. 2. Provide Structure and Consistency - Young children need regular schedules and guidelines. Constancy helps provide a safe and predictable environment. 3. Gather Data - Keep a log of challenging behaviors. When does the behavior occur? What is the child doing before and after it happens? What is going on in the child’s life when the behavior takes place. If you see a pattern, then you can create strategies to address that behavior. 4. Change the Setting - Remove the child from the immediate setting so a behavior is reduced or eliminated. 8. Avoid Power Struggles - Try to negotiate with your child. An example could be, “I’ll pick up one toy and then you pick up one toy". Depression is avery real and serious illness that can leave you feeling completely hopeless, helpless, and out of control. Sometimes it can seem like we have put on a new pair of glasses, or lens, and suddenly everything in our past and everything in our future looks different. It's important to remember that looking through a new lens can change everything and we want to be sure we are aware of the lens we are wearing. Now, this is not to say that the lense of depression is not real, or that the feelings one has while depressed isn't real, because they are. However, we have to be aware of what we are looking through because otherwise our whole past and future could become clouded with unhelpful or tainted versions of the truth. If you are the one struggling with depression, it's important to talk to someone that knows and loves you well. Try exploring with them if your feelings are based in facts, or if your facts are being changed to fit your feelings. It can be hard to recognize this yourself, so feel free to also talk to a professional. Depression is a very treatable disease and it all starts by acknowledging that we are seeing and feeling things differently than before. In the spirit of the New Year and resolutions, consider taking time to reflect on ways to be a better partner in word and deed. The tendency may be to tell your partner how he or she could be a better spouse, but first try to lead by example. Below you will find a list of statements or approaches that can be detrimental to a relationship if not addressed. As you go through the list, give yourself kudos for the ones you are already avoiding and use that momentum to rid your speech and conduct of the other items. In all of these, the underlying notion is promoting validation and empathy in the relationship as they are two crucial components to feeling loved. Now that we’ve touched on that, NEVER threaten divorce or leave if you don’t want it to happen. This erodes the foundational commitment you made in your vow. Avoid telling your spouse they need to stop talking or calm down; instead ask for space or a time out. Comedian Tim Hawkins provides additional more specific tips for husbands here if needed. When considering a job change is an important concept of which to be familiar. Transferrable skills can be a key factor in your resume, cover letter, and interview. What are transferrable skills? Transferrable skills are any skills you have acquired throughout your lifetime. They can be from jobs, classes, projects, parenting, hobbies, or anything that can be transferable and applicable to what you want to do in your next job. If you are applying for a job in your current field it is pretty easy to find skills you have to transfer to a similar job. However if you are changing careers or an entry level job seeker, it is much more difficult. To know what skills to highlight you should first know some about the employer and the specific job you are applying for. The job posting usually gives you a good idea of the skills they are looking for. It also can’t hurt to put skills every employer is looking for like punctuality, working in a team, communication, and leadership skills. Also think of other skills you have and how you can transfer it to what you want to be doing and how you can portray it that way. If you can’t make a skill fit what you want to be doing, leave it out. For example, you’ve spent the last year off of work raising twins. Transferrable skills could include: multi-tasking, patience, time management, and teamwork. Conflict is rarely an area of relationships in which anyone becomes comfortable, yet anyone with healthy and growing relationships will tell you that conflict is inevitable. All too often, in the swirl of uncomfortable feelings that surround initiating difficult conversations or voicing another perspective in midst of an already tense interaction, it seems wiser—or at least safer—to self-silence. All sorts of messages begin popping into the mind, justifying why it is better to keep quiet. “He won't understand…I don’t want to start a fight…She’ll be so upset with herself if I tell that she hurt me…” So the emotions get pushed down and ignored. But like a beach ball in a pool, feelings can only be pushed down so much before they find another avenue of escape. Emotions that are stuffed down and left undealt with at best inhibit conversations that lead to deeper understanding and connection within the relationship, and at worst stew into resentments that lead to passive aggressive or even aggressive attempts to indirectly communicate dissatisfaction, ultimately causing even greater damage to the relationship. Either way, avoiding the discussion of awkward or distressing feelings and experiences obstructs the free flow of communication, which is the foundation and life-blood of every relationship. So as difficult as it may feel, lean in and speak up. It is important to share your thoughts and feelings in close relationships, especially the burdensome ones. If the idea of sharing those feelings is too overwhelming, try scripting out what you want to say. It may also be helpful to see a counseling professional who can help you develop the skills and confidence needed to engage well with your emotions and communicate them effectively. Many children face emotional difficulties from time to time. Feelings of anger, loss, sadness and emotional extremes are part of growing up. Disagreements between parents and children might be unavoidable as children struggle from the “terrible twos” through adolescence to create their identities. These are common changes in behavior due to growth and development. Such problems can be more typical in times of change for the family, such as the death of a family member, a new baby, or a move. Usually, these kinds of problems tend to fade on their or with limited visits to a counselor or other mental health professionals as children adjust to the changes in their lives. On occasion, however, some children may develop intense emotional and behavioral responses to situations in their lives that persevere over time. The recognition that a child’s behavior requires the help of an expert can be frightening to parents who have tried to support their child, or it may be accepted and internalized as a failure by the parent. If you are facing any of these issues, seeking private counseling is a good way to start the process of finding out what is going on with your child's emotional health. Also, make sure you are working with the school counselor. Professional school counselors are a great resource as you begin looking into behaviors that the school is observing. Creating a partnership between school and the therapist is vital in helping your child through the tough times as they grow and mature.